This crater on Mars, named Jezero, was once a lake — and on the right-hand side of this image, a flood long ago burst through its edge, creating a canyon. Scientists have identified 24 ancient lakes on Mars that once overflowed and burst through their walls, forming steep-sided canyons — and NASA's Mars 2020 rover will explore the neighborhood of one of these paleolakes, looking for traces of ancient life. Jezero Crater is one of two dozen sites that a team of geologists examined for signs of how canyons formed: by massive individual flooding events or by slower flows over longer periods of time. Their findings suggest that for the chosen canyons, the former occurred, with a sudden flood rapidly carving canyons across the Martian surface. The team came to that conclusion by looking at the relationship between the canyon measurements and the crater rims that once enclosed all that water. Because the canyon size increased in proportion to the size of the nearby lake, the team believes that all 24 lakes violently burst through their walls, carving the canyons in perhaps just a few weeks. If they hadn't seen such a correlation, they would have instead suspected that the canyons formed gradually from more gentle water flow. And unlike geologic features here on Earth, lake beds and canyons remain etched on the surface of Mars, since there are no modern plate tectonics to shuffle crust around and destroy them. "The landscape on Earth doesn't preserve large lakes for a very long time," co-author Caleb Fassett, a planetary scientist at NASA, said in the same statement. "But on Mars ... these canyons have been there for 3.7 billion years, a very long time, and it gives us insight into what the deep time surface water was like on Mars." That long-lived Martian surface offers scientists hope that they might be able to access ancient sediments that may hold the remains of any life that once existed on Mars. 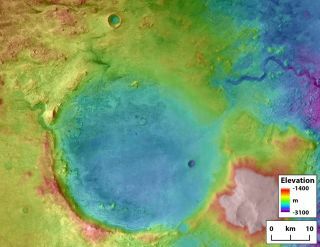 That's part of why NASA chose to send its Mars 2020 rover, due to touch down on the Red Planet in 2021, to Jezero Crater, where it can study five different types of rock and hunt for any remains of ancient life that could be hiding in such a formerly wet environment. The new research is described in a paper published on Nov. 16 in the journal Geology.